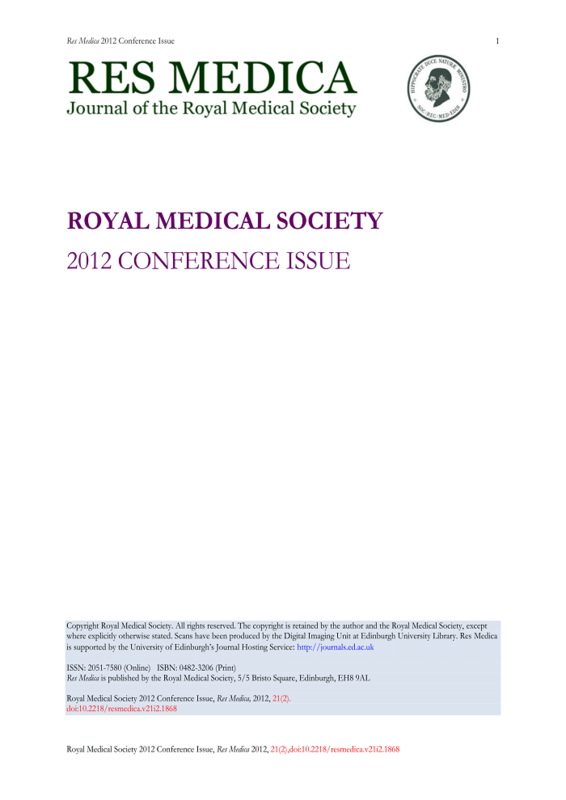 Abstracts from the 2012 RMS Conference. I am a current 5th year medical student at the University of Edinburgh. I am also a qualified commercial solicitor with a background in corporate, charity and media law. I have been involved with Res Medica for 3 years now and have served as Editor-in-Chief for the last 2. Res Medica is a storied institution with which many remarkable people have been associated throughout its storied history. I firmly believe that it presents an incredible opportunity for students and practitioners alike to gain an understanding of the practicalities of academic publishing and medical journalism and to hone their skills in critical appraisal and peer review. As editor-in-chief, I am committed to ensuring that the journal is as effective as possible in achieving its goals of supporting student research, conferences and other academic endeavours wherever possible. Floreat Res Medica.